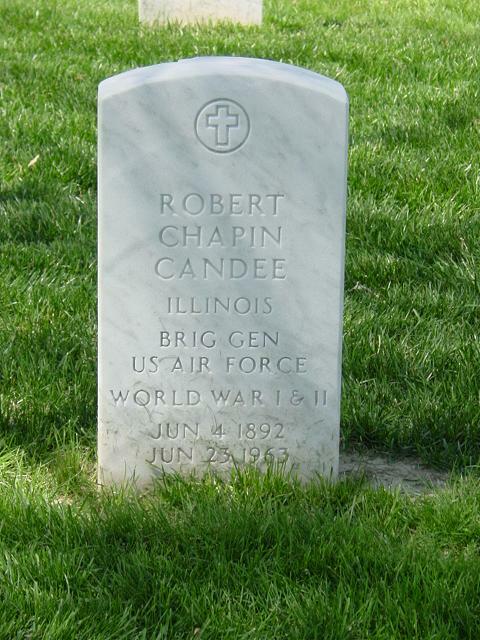 Robert C. Candee was born at Hinsdale, Illinois, in 1892. He graduated from Cornell University in 1915, and the following year was appointed a second lieutenant of Cavalry in the Regular Army, with which he served until July 1922, when he was detailed to the Air Service. Following graduation from the Air Service primary and advanced flying schools, he transferred to the Air Service in March 1942, and two months later became an instructor at the Air Service Advanced Flying School at Kelly Air Force Base, Texas. In September 1926 he entered the Air Corps Tactical School at Langley Air Force Base, Virginia, from which he graduated a year later. He then entered the Command and General Staff School at Fort Leavenworth, Kan., and following graduation in August 1928 was appointed an instructor at the Air Corps Tactical School. He went to Albrook Air Force Base in the Panama Canal Zone in July 1932 and served there until November 1934, when he returned to the United States for duty in the Plans Division at Air Force headquarters in Washington. He enrolled in the Army War College at Washington, D.C., in August 1935, and upon completing the course the following July entered the Naval War College at Newport, R.I. Following graduation in September 1937, he was transferred to Hickam Air Force Base, Hawaii. Two years later he was assigned to the Office of the Chief of the Air Corps in Washington, with duty as chief of the Information Division. In August 1941 he joined the Fourth Air Service Command at Hamilton Air Force Base, California, and the following February began a short tour of duty with Army Ground Forces headquarters at Washington. Shortly afterward he transferred to Eighth Air Force headquarters at Savannah, Georgia, and from there was assigned as commanding officer of the Eighth Ground Air Support Command at Bolling Air Force Base, D.C. He was promoted to brigadier general in June 1942, and a month later took the Eighth GASC to Europe, where he commanded it until October 1943. At that time he returned to the United States to become senior air instructor at the Army and Navy Staff College in Washington, D.C. In December 1944 he was appointed director of air instruction at the Command and General Staff School at Fort Leavenworth, Kansas, and the following November reverted to the grade of Colonel. In June 1946 he became deputy chief of staff of Air Defense Command at Mitchel Air Force Base, New York, and in July 1947 was appointed comptroller of Air Defense Command. The following April he was promoted to brigadier general and in August 1948 assumed the additional duty of chairman of the Great Lakes Area Sub-Committee of the Committee on Facilities and Services, Munitions Board. In December 1948 he became comptroller of the newly-organized Continental Air Command, with headquarters at Mitchel Air Force Base, New York. General Candee has been awarded the Distinguished Service Medal and the Legion of Merit. He is rated a command pilot, combat observer, technical observer and aircraft observer. General Candee was buried with full military honors in Section 34 of Arlington National Cemetery.